Wow! My blog certainly has been idle for a long while. I took a hiatus for several months to do other things including to spend more time with my family. I’ve been staying active and trying my hand at gardening (again). I’ve been knitting and reading as time allows… sometimes I like to be a bit of an introvert and that seemed to be a theme this year as I worked through the frustrating feelings the health battles of last year left me with. Here is a synopsis of what has been happening in my life. My children are doing well. I’m happy for summer break and a reduction in the amount of school-borne illnesses. It was a rough Spring with cold after cold that would spread to everyone in the house. I nicknamed it the “kindergarten crud”. My daughter is really excited about being a big girl going into the first grade. She’s working on reading by herself and learning to ride a two-wheeler without training wheels. I’m keeping the first aid kit well stocked for knee scrapes. Miss K. is somewhat competitive with her big brother so she shows great determination but the balance of riding the bike is a work in progress. Speaking of her brother, my son is turning out to be such an amazing young man. This is the Mom Brag warning. Now where was I? Oh yes, TC is on the Minister’s Student Advisory Council for 2016/2017 and will attend the Ontario Leadership Education Centre this summer. This is his second term. He has also landed his first full time summer job and it’s a fun one. He is working for the school board as a day-camp counsellor. Seeing him leave for his first day last week was akin to putting him on the school bus that first morning 11 years ago. There may have been a few tears. I’m so proud of how he has taken such initiative. There are times though, that I miss my chubby-cheeked little boy. My last post was about my training to be a Physical Activity Community Educator (PACE) with the Grand River Community Health Centre. Training went well and I am into my fourth month of leading fitness walks each week. I’m also doing some one-on-one mentoring which I feel is an important support for people. I’m finding that I am getting as much out of this experience as the people I am working with. It’s very inspiring seeing the enthusiasm at the start of someone’s journey. This is also a great way to get me out of my office and into the community in a meaningful way. Sadly I have to step back for the month of August but I hope to be back at it in September. Outside of the initial training for PACE I’ve taken a few courses on my own such as fundamental movement skills, physical activity in the heat, and concussion awareness. Currently I’m studying a 4-week course called Physiotherapy, Exercise & Physical Activity. I’m tossing around the idea of taking college courses to become a personal trainer or fitness coach – maybe. Or perhaps there is another book in my future? I’m still not entirely sure which direction I want to take with this. I feel that with my own journey I have much that I could bring to whatever I eventually decide to do… after all, I know how much dedication it takes to change your life. Camping is on the summer agenda of course and I’m excited about that. We had to adjust plans to suit the boy having a job but it is all working out well. I’ve decided to pitch my tent at the same place where my heart problems started last August… Bruce Peninsula National Park. I’m considering the trip a bit of a restart. I promise to post some photos and a trip summary when we return. I bought a new camera as I broke mine at the same spot last year so I’m going to play around with that a little. And a dear friend and her family will be coming from Ottawa to camp with us. We met through running and get along quite well. I haven’t seen her in person since September and it is going to be a great adventure. I ran two events this year. 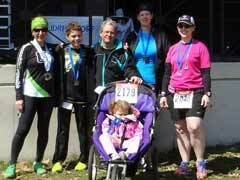 The first was the Oakville Mercedes 10K at the end of April. I chose to drop down to the 5K distance and walked more of the course than I expected to. It was great to be back at a start line though. There is just something wonderful about the race day vibe. The second was the 5K run at the Ride for Heart in Toronto. I was an ambassador for the Heart & Stroke Foundation so I got the VIP treatment. Here are the details. I ran in memory of Chuck Orosz and Bill Langman. Chuck was a friend of ours who passed away suddenly from a heart attack last summer. I missed his memorial service because of my own heart issues so I wanted to do this as a way to honor him. Bill was my Daddy. He died of a heart attack when I was a teenager and I miss him terribly. Thankfully the rain held off and it was muggy but with a nice breeze. I ran some of the course and I went out really strong but I also walked a lot more than I had anticipated. I’d been dealing with all sorts of issues as I tried to rebuild my base so I knew that I wasn’t going with any sort of a running base. A few weeks before the event a lovely friend said to me that the victory lies in being alive to enjoy the start line, so I carried that thought throughout the race. During my extended walk breaks I took the time to talk to others walking about why they were running or walking this event. Some of the stories were incredible. One lady had emigrated from Israel and her family history of heart disease was so bad that two of her brothers became cardiologists. Another group was doing the event under the name Team Carol because their friend passed away from a sudden heart attack last year. With each story I realized what a gift it was that I could participate in the event and how being an ambassador for the race helped me through a very difficult time in my life. I ran most during the last kilometre where I encouraged a woman who was struggling so that she could cross the finish line as strong as possible. A few hundred metres before I parted ways with her and ran to the finish line. Even though there were some things about this event that could be improved, this race reminded me about one of the things I love most about the running community and that is the way we support one another. Oh and being in the first group of runners to ever do a race on Toronto’s Gardiner Expressway was cool too. 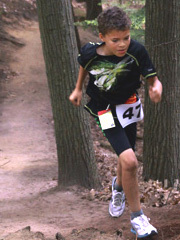 Speaking of running, Bryan, the kids and I are participating in Chase the Coyote this coming Fall. It’s a trail race that has three distances. Bryan is running the 14.4K and the rest of us are running the short course which is 5.7K. Miss K is merely six years old so this will be a good distance for her. She’s quite exuberant about running so it will be fun to train with her. We are still undecided about which of us she’ll run with at the event but she seems to be leaning towards getting her brother to be her sidekick. Well that’s all for now. I’ll be posting some gear reviews and other ramblings over the coming weeks as I start my return to regular writing. Life is short… go out and embrace it! B(e) Positive! In December, when I shared the news that I was invited to be a Digital Champion with Canada Running Series for the Toronto Yonge Street 10K, I had no idea what was in store for me. What transpired next was a fairly difficult time in my life. I had returned to training after my broken toes healed but my heart had other ideas. I was unable to cross the start line on Yonge Street because I had to have a heart procedure mere weeks before race day. Having to back out of something I had whole-heartedly committed to was devastating but my fellow Digital Champions never wavered—I was embraced by a circle of support that I hadn’t expected. Being a Digital Champion taught me that sometimes our connection goes far beyond training and encouraging one another. It was deeper than I ever expected… a kindred relationship that began with our love of the run and then transcended it. At that point I decided that I would be the best cheerleader I could be in the days leading up to the event. As difficult as it was for me, I chose to be at the start line to see the other runners head out when the horn went off. I choked back tears while cheering as loud and exuberantly as I could. A few weeks later I happily returned to running again. I have been invited, once again, to be a Digital Champion. Of course I accepted and this time I will be representing the 25th Scotiabank Toronto Waterfront Marathon (STWM) alongside 49 other runners marathoners who inspire me beyond words. You can find out more about this diverse group on the Canada Running Series blog. I hadn’t intended that my decision to run a full marathon would actually be a comeback story, but it seems life has taken me in that direction. As training progresses I will share more about my journey to the start line of my first marathon. Please feel free to send me a message if you have any questions or comments. I’m @innerpossible on twitter or you can connect with all of the Digital Champions using #STWM. Yesterday was Mother’s Day. I am so proud to be a Mom and my children are the centre of my universe. My darling Tobias is now a teenager but he still has the big heart of the sweet little guy I used to cuddle in my arms. For Mother’s Day, aside from the gift he bought me with his allowance, he gave me something that I will never forget—his time. His Dad is away right now and that coupled with the fact that his little sister Kaia won’t have anything to do with the running stroller now that she’s older, makes it difficult for me to get time to train. Tobias offered to watch her while I ran yesterday, so I took him up on it and hit the treadmill. Before I tell you how that went, let me back up a bit. You may have read that I broke my toes in November and then had a heart procedure about 6 weeks ago. Nearer the end of April I was given the green light to train for a full marathon. During all this time off I lost some of my cardiovascular fitness. I also developed some anxiety which is very common with heart patients. I would think about running and be overcome with the fear that I wouldn’t be able to breathe again. So I’d skip the run or I’d start to run, panic, and shut the treadmill off after 2 or 3K. I knew that if I was even going to consider a full marathon this Fall I would need to push through this. Here I was with a strong, healthy heart and the blessing of my cardiologist to train; backed up by extensive testing. Yet I was gripped by a debilitating fear about my heart. Tobias asked me how far I was planning to run. I told him 4K as that was what I had put in my training plan. I started to run and I decided that I wouldn’t allow myself to give up until I had reached the distance I promised him I would do. At 2.5K I started second guessing myself again. I changed my music and kept going. Then I hit the 3K mark followed by 4K. The fear hadn’t been there like the last few attempts and I was actually feeling great even though I was finding it tough. I said to myself… “Self, why don’t you just do the 5K? You know it would make you happy.” Yes, I talk to myself when I run—it’s a runner thing. My son came out to see how I was doing and I asked if he minded watching Kaia a few minutes longer because I wanted to try for 5K. He agreed with a “Go Mom Go!” and then Kaia came out and joined in the cheer. So, with the best cheering squad a Mom could ever hope for, I continued to run. The kids headed back to Tobias’ room to play with Lego. When I saw 5K on the display I started to cry. I paused the treadmill, called out to Tobias and he came running out to see what was wrong. Between the sobs I explained that these were tears of joy and that I was more than okay. I was hot and sweaty and I felt really good. Accomplished. Three months ago I thought I would never be able to run again. To run past the fear meant the world to me. It showed me that I can do this and that I am still a runner. This was a major breakthrough and one I desperately needed for my mind, body, and spirit. Tobias’ providing me with an opportunity to run without distraction turned out to be one of the most wonderful Mother’s Day gifts he’s ever given me. I can’t thank him enough. In being so giving he helped me to find my inner possible again—that part inside of me that makes even the most difficult challenges seem possible. This is my guest post as it appeared today on the Scotiabank Toronto Waterfront Marathon (Canada Running Series) blog. TORONTO. January 11th 2014. Digital Champion Laurie Ann March works hard to balance her hectic life with her love of running. She will tell you that she treats being active as a priority and with good reason. 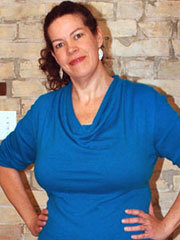 Laurie changed her lifestyle drastically in order to successfully lose 180 lbs. Laurie’s family has joined her on her running journey and she believes that being active is a great way to spend quality time together. Connect with Laurie on Twitter @innerpossible. When I made the decision that I was going to train and run my first 5K race I expected that I’d be doing this on my own. My husband Bryan and I bought a treadmill in late 2011 so I could work towards becoming a runner. What happened surprised me. Bryan, who for years insisted that runners never smile and running fun did not belong in the same conversation, announced that he would run the race as well. I almost fell off the treadmill in shock. What happened to “over my dead body” or “when hell freezes over”? Our eleven year old son, Tobias, voiced that he wanted to run the race too and the next thing I knew we were a family of runners. The whole family was outfitted with good quality footwear and training began. As the weather improved we purchased a running stroller for Kaia, our eighteen month old little girl, and started running outside. You are probably wondering about the stroller—it has been a wonderful thing and Kaia loves to ride in it. 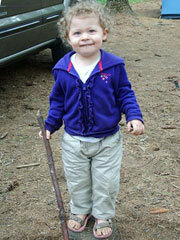 The key, as we quickly learned, is to make sure she had a few toys, a snack, and something to drink. Making sure she is comfortably dressed for the conditions is important too. It is adorable to hear her cheering Bryan on. “Faster Daddy! Faster!” she often exclaims. After a run we take a detour to the park. This allows us some time to stretch while she has fun on the playground. One can’t put on running clothes in our house without her getting excited and she gets a little bit upset if one of us is merely going for a jaunt on the treadmill. Well, downright grumpy might be more accurate. If the weather is inclement we run at the indoor track and she loves that too. Bryan usually finishes a bit before I do so he releases Kaia from the stroller. She’s older now and runs just over one kilometre around the track. She loves it. She will be turning four in June so the stroller will be retired soon. When that time comes Bryan and I will have to take turns going on our runs or consider hiring a sitter. Of course, we’ll still take her out on her own little adventures. There are many benefits to being a running family. It keeps us fit. It gets the kids outside and reduces their screen time. It creates an environment of support which spills over into other aspects of our lives. Running as a family is a wonderful way to combine training with spending time together. Bryan, Tobias, and I run at different paces so we usually do our warm-up together and then go off on our separate runs, then meeting at the end. Tobias will run with me from time-to-time but if there is a race coming up and he needs to push his limits he goes with his Dad. Bryan travels extensively with his career so it is a perfect time for them to have those guy to guy chats. Last spring I trained for my first half marathon, Tobias wasn’t able to run as far as I was going so I set out on my own one Saturday morning. About 15K into my run I heard a familiar voice shout “Hi Mom” and there he was on his bicycle. He told me that he was amazed at how far I ran and that it took him awhile to catch up. Next thing I knew Bryan, who was recovering from a nasty chest cold, was there on his bike with Kaia in tow. This gave me just that little spark I needed to keep going. One summer day Bryan watched Kaia while Tobias and I hit the trails near our home. We decided to go without a pre-set plan and be spontaneously adventurous. There are some beautiful side trails that weave in and out along the Grand River so we would just turn at a whim and see where we end up. At one point we were forced to turn around because the brambles were so thick that it was becoming extremely difficult not to mention a little hard on the legs. We do this from time to time and those runs really bring out my inner child. A favourite memory is from my first 10K event—a very hilly trail run that took place one night in October. I am diabetic and I had a serious blood sugar crash around the 5K mark. I almost walked off the course because I had taken too much time to deal with that and wasn’t feeling well at all. Emotionally this run was taking its toll. The water stations had been taken down and the paramedic was sweeping the course behind me but I was determined to finish even if I was dead last. Just then, Tobias ran up to me and said that we were going to cross the finish line together. He had received permission to get back on the course to run with me and had a medal around his neck. I knew there were no finishing medals for this race and he told me he won first place for his age group. I was so proud of him for doing his best and I would have been even if he hadn’t been given an award. He told me that he was proud of me too. I fought back the tears because I was extremely moved that he came out to run with me. It made my night and turned what was a rough experience for me into one I will always cherish. It was in that moment I realized how running has brought us closer as a family. What we have discovered is that introducing the kids to running was much easier than I could have imagined. By making it a part of our lifestyle and keeping it fun, our children seem to have embraced running and it has truly become a family affair. So, whether you are a seasoned runner about to enter into parenthood or you are a new runner trying to figure out how to balance training with a busy family life, perhaps you can find some inspiration from our little running family. Do you run as a family? How do you get your kids and partner to share in your love of running? Connect with the Toronto Yonge Street 10K Digital Champions team here! Oh I just adore how our city decides to clean the sidewalk with their noisy little contraption at 3:30 am. There I was, laying in my peaceful repose when I could hear the sound of ice and snow being scraped off my sidewalks. I’m not completely without appreciation but at that moment I was not very impressed. I picked up my BlackBerry and decided I would look and see what was in the news feed of my Facebook application. What I saw was my friend Crystal asking some questions about blogging. In a sea of anti-blogging comments my groggy self tried to explain the pro side of it all. Let me tell you that my thoughts are not particularly gathered at 3:30 am, especially given that I don’t have the clarity of mind that is provided by that first mug of my favorite Italian roast coffee until a later hour. So I’ve decided to write something along that lines this morning now that I am adequately caffeinated. I first started this blog in March 2011 with the following words. Almost two years have passed and I can say that this space has become much more than pixels on a screen. While I have inspired people and I receive such lovely notes about it all the time, the personal growth that has come from sharing a small part of my journey has been nothing short of remarkable. My friend Kristin of Kristin’s Glas speaks of blogging as a way of being “open and vulnerable in her post entitled What Blogging Means to Me. My blog has allowed me to share with you a little about who I really am. It has helped me grow and show that vulnerability which Kristin talks about. There is a bit that goes on behind the scenes too. For every few posts you see there is one you don’t see. The posts that are never published are held back because they might be too personal or written in a moment of extreme hurt because someone let me down. There are times when a relationship would mean more to me than what I was feeling so I exercise judgment and use of the delete function. However, the act of writing it out enables me to work through the emotions and decide how to move forward. It’s cleansing in a sense. Over the life of this blog you’ve read about my health issues and triumphs, you’ve watched my progression and obsession blossom as I became a runner, and you’ve read about some of the grief and loss I’ve experienced recently. You’ve watched me grow and change and find my true self. Finding My Inner Possible has not only been a great tool for learning more about the person I am and the one I strive to be… it has also connected me with many wonderful people around the world. Some of these people have been part of a great support system. Is blogging for everyone? No, you have to love to write and be somewhat committed to writing as often as you can. For me, it’s the best thing. Writing keeps me motivated. Writing keeps it real. Have a great Friday and don’t forget to (B)e Positive! P.S. I was fortunate enough to meet Kristin because of a blog. She featured one of my recipes in her foodie blog a few years back. We became connected outside of the blogging world and she even ran my first 5K race with me last April. I am proud to call her friend. It’s a great topic so I will share that answer here with all of you. Sally is right about weight loss only being a small part of it, like the cover on a complex book. Let’s look, briefly, at the first chapters of my journey before we talk about where I am now and what some of the other benefits have been. Emotionally, I was very timid albeit I put on a good front in social situations. I’d get anxiety when we had to go anywhere. I’d actually toss my cookies before we went out and sometimes my husband Bryan would even have to stop the car. I was terrified of rocking the boat. If you said the sky was yellow and I knew that it was blue, I’d agree with you just so you’d like me. I felt like everyone was judging me because of my weight and some people were. I had absolutely no confidence and I felt alone even in a crowded room. When it came to self-image, I hated looking in a mirror and I hated myself. I detested shopping for clothing. I wanted to hide. I quit taking care of myself on the outside and on the inside. I started becoming reclusive and would barely leave the house; instead I would have friends come over to visit. Even then, I’d often cancel at the last moment. I lost all of my passion for the things I enjoyed doing, including artistic endeavors. Physically, I was prone to extreme bouts of bronchitis and occasionally pneumonia. I’d be down for six to eight weeks at a time and it would take months for my breathing to return to what was normal for me back then. My nails were brittle and my scalp was always dry. My hair would fall out in handfuls. My skin was even affected. I was tired all the time and listless. My posture was awful and I had a hump shape to my back because of excess fat. I had one across the hips too and would often suffer horribly from sciatica. Standing up straight was impossible because of both the weight and years of trying to make my almost 6 foot tall frame appear shorter. I was klutzy because I was so self-conscious and I was always falling. The transformation started and here’s the answer to Sally’s query. As Sally mentioned, it wasn’t just the weight that came off. Everything started to heal. My skin and hair were better. My nails became stronger. My posture improved. The sciatica was a thing of the past. I wasn’t horribly hot all the time and I could actually sweat. But what was happening inside was more remarkable. Just over two-thirds of the way through this weight loss I was diagnosed as diabetic and put on insulin, and, as you probably read in earlier postings, I reversed all need for diabetes medications. My enlarged heart started to reverse, my liver enzymes sorted out, my blood pressure went down dramatically. Over a decade of infertility was resolved because my hormones leveled out. Diabetic retinopathy, a serious eye condition, started to heal. My cardiovascular health improved and I can breathe. I can run up the stairs and not have to pull myself up with the banister. Even intimacy is different. Not just with my darling husband but even something simple as hugging a friend. Hugs no longer make me cringe. Now I’ll tell you about the emotional side of things. This change in me has been as much to do with weight-loss as it has to do with the confidence that came from putting on a backpack for the first time and going into the wilderness. That energized my spirit as well as my body. I wanted more. As the outer transformation started so did the inner changes. I finally decided to become a Mom. In the same year I started pursuing my dream of becoming a published author and freelance writer. I started doing things that I loved again, and picked up a sketchbook for the first time in years. I embraced being daring and did things I thought I could never do. Things that others told me I couldn’t do—canoeing, backpacking, cycling, running, and hiking. I did them despite the naysayers. The more I did, the stronger I became and the more things I wanted to try. I started thinking positive and accepting that I didn’t have to put limitations on myself just because others had—that I can do anything I put my mind to. I’ve embraced that I am my own person instead of trying desperately to be who others want me to be. I share my opinions even if they differ from my friends. I make the first move to introduce myself to new people and I am strong enough to walk away from negative people who try to sabotage my efforts and hold me back. I even garnered enough courage to teach wilderness cooking workshops and am considering becoming a motivational speaker. Teaching, even though it was my dream, was something that I would have never done when I was obese, because I was just way too self-conscious. I am no longer so ashamed of the obesity and I can share my “before” photos because I’m proud of what I have accomplished—that I have overcome what I once thought was impossible. So there you have it. Losing weight isn’t just about what others see on the outside, it goes far deeper that. It is a culmination of a healthy body, mind, and spirit. It’s about creating boundaries with how I fuel my body while breaking the boundaries of what I perceive I am capable of doing from a physical standpoint. It’s about becoming whole and being confident, meeting challenges head on and accepting myself and all my idiosyncrasies. Funny, I don’t often think of myself as being an inspiration even though my intent of starting this blog was to be just that. I blush profusely when I read comments from strangers such as “I just read your story. Love it! That is so incredibly inspiring.” or “Everyone has the power within themselves to be great and Laurie exemplifies this so beautifully. What a force & exceptional role model for believing in your inner power & strength.” I find it somewhat overwhelming but I also find that it is motivating for me in so many ways. Going public with my story was profound for me and summoning up a great deal of courage to put it out there has been a gift as well as a learning experience. Being open about my story has taught me a great deal about how strong I am. To know that I can make a difference to someone who may have similar struggles helps me move forward on my own journey. However, there was something that happened recently that makes me realize how much responsibility comes with the lifestyle choices I make. It was a little closer to home. The other day I had just come in from stretching after a trail run and as I walked by the full length mirror on my closet door I realized something… I have really great legs. I know that sounds full of vanity but I love how they look and feel. I paused, flexed, and marveled at their definition with a bit of wonder. Hmm… when did that happen? I didn’t remember them being quite that way. I said to my husband, Bryan, “When did I get such defined leg muscles?” He chuckled and reminded me that I’ve always had strong legs but mentioned that he noticed a while ago that they had become very toned. Later that day Bryan told me what she did. It isn’t the first time she has mimicked me. Kaia adores stretching when I stretch and playing with her soccer ball like I exercise with the stability ball. However, it was in those few moments, while listening to his story about my baby girl, that I realized there is something bigger at play here. You see, this reminded me that Bryan and I are probably the most influential role models for Kaia and her brother Tobias—a responsibility that cannot be taken lightly.